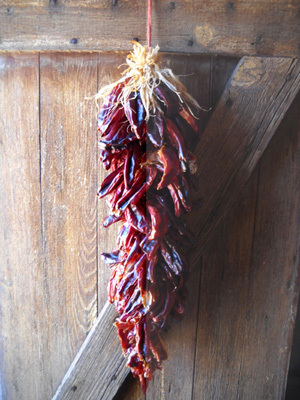 to establish a military post on the Rio Grande in the area of El Paso del Norte." 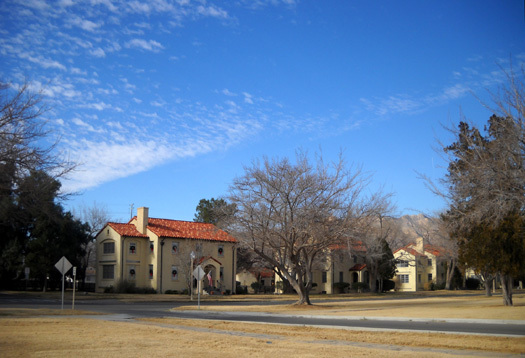 That garrison, established in 1848, was the first of six different sites that have been used for what is now known as Fort Bliss. Frequent Indian raids necessitated moving the posts to deal with shifting threats -- as did flooding by the Rio Grande. 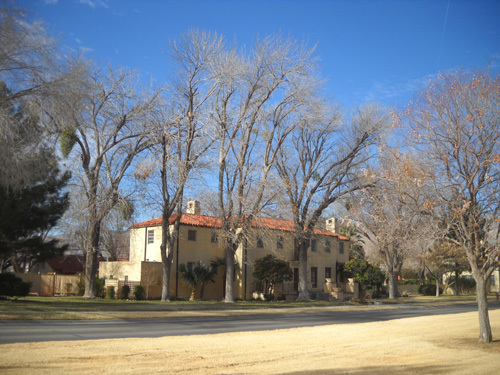 Its location since 1893 has been on the east side of El Paso. 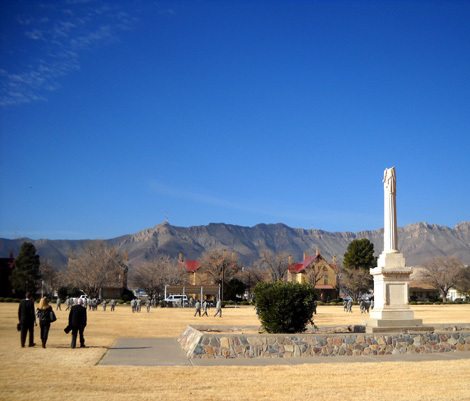 Besides all the moves, this post has withstood several name changes (it became known officially as Fort Bliss in 1854), changes of command (including Confederate forces in Texas), continued Indian skirmishes, a second Mexican skirmish, and a war I've never heard of (the Salt War of San Elizario, site of one of the missions I mentioned in the last entry). The primary functions of the post have continued to morph through the years, too: from an infantry station to the largest cavalry post in the country (1921) to an artillery post and anti-aircraft (guided missile) training center (beginning in the 1940s) to an army air field (Biggs, established in 1966) and U.S. Army Air Defense Center. 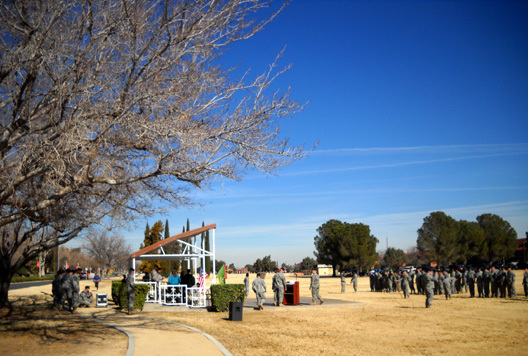 Fort Bliss is in the midst of another functional transformation right now, thanks to the BRAC commission. In 2005 the Pentagon began realigning and consolidating military posts and bases across the country in an effort to streamline its unwieldy network. I first learned about the acronym BRAC (Base Realignment and Closure) when we stayed at the FamCamp at Fort Sam Houston in San Antonio the past two Januarys. We could see a lot of new construction on post in 2009 and 2010 as it prepared for some changes in its structure and an influx of soldiers. While some installations have been closed, Fort Bliss is expanding its workforce by thousands of people (over 11,000, per one source I read) who are coming from other posts in Germany and the U.S. It is being transformed into a heavy armor training post (U.S 1st Armored Division) and its air defense functions are being transferred to Fort Sill in Oklahoma. The transfers are scheduled to be completed this fall. Fort Bliss employs a lot of people: about 35,000 soldiers after this expansion, plus thousands of civilian support personnel. 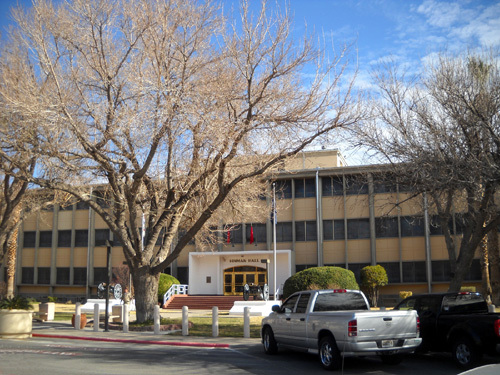 The majority of them work at the main post on the east side of El Paso and the adjacent East Fort Bliss. You can imagine how large an economic impact this many people have on the city of El Paso. Since they're already employed they're adding revenue and jobs to the area, particularly in the areas of housing and retail. The city is busy with infrastructure improvements to accommodate them (roads, utilities, schools, etc.). 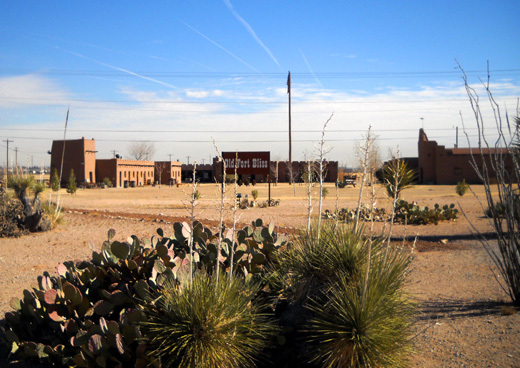 Fort Bliss covers much more than the main post and eastern post. It's one humongous military installation -- approximately 1,700 square miles in size! Most of the land is in New Mexico, stretching north from El Paso to the southern boundary of the even larger White Sands Missile Range. 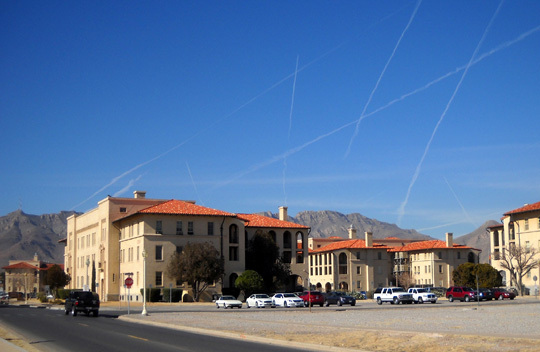 About 1,500 square miles of the land comprising Fort Bliss are used for missile and artillery training and testing. If you look at a map of New Mexico that includes the El Paso, Texas area you'll see just how far these adjoining missile ranges stretch. Jim visited the post back in the '90s when one of his sons was stationed here but this is the first time we've camped at Fort Bliss. 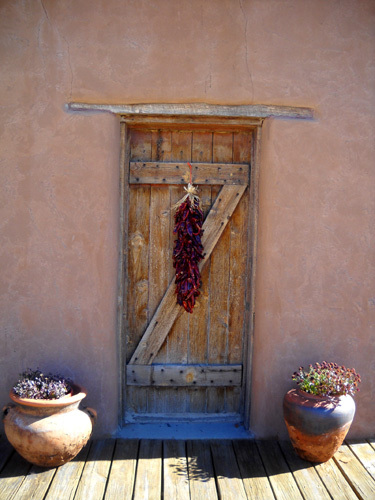 We chose to stay for seven nights because there is an attractive weekly rate (seven nights for the price of six). Although it's not our favorite FamCamp among the dozen or so that we've used around the country, it has enough positive features that we feel comfortable recommending it to other active and retired military families who are eligible to use the facilities. 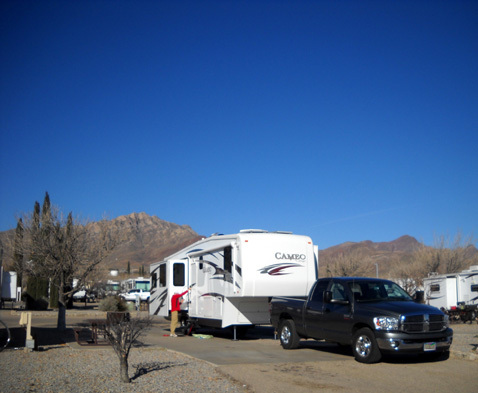 I must admit that we liked the campground more than El Paso itself! 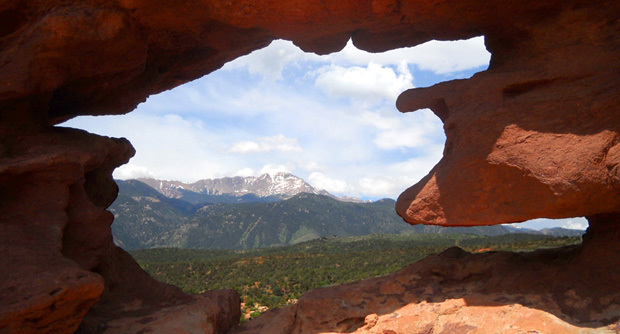 Keep in mind that everyone has different preferences re: what they seek in both a campground and the local area. Our opinions are based on what matters to us. YMMV. 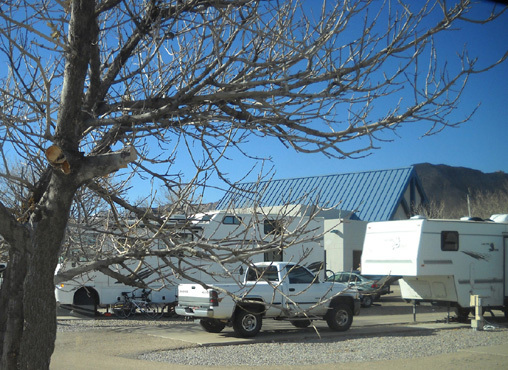 Despite the downsides we enjoyed camping in the RV park and were grateful that we had full hookups at a reasonable cost and excellent TV, phone, and internet connections. Those things more than made up for what we considered to be disadvantages. When we weren't motivated to go out to run/hike or sightsee it was nice to hunker down inside our warm camper and read, get online, or watch TV. 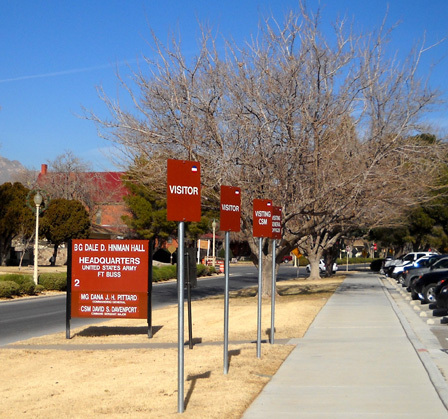 The main post at Fort Bliss is easy to navigate compared to some others we've visited and it's easy to reach from the RV park unless a road is blocked during construction. When that happened, we just used a different gate farther down US 54. The closest gate (Sheridan, on Haan Road) is about a mile south of the campground at exit 24 on US 54. That street took us directly to the commissary, PX, food court/mall, Post Office, and hair salon where I got my hair permed. From there it was simple to find a fitness center, the replica museum, and a nice four-mile running-walking-cycling path. Part of the crushed rock running path goes by handsome houses for officers. There are other gates convenient to the campground at exit 23 (Cassidy Road) and exit 22 (Pershing Road). Entry at the two gates we used was efficient with our military IDs. We bought our groceries at Walmart and Sam's Club so we can't comment on the commissary. We did like the very large PX and the indoor mall in which it's located. Jim and I avoid malls like the plague, but this one is less obnoxious than most private retail malls. We enjoyed the food court with its international selection of about fifteen different take-out and sit-down restaurants. We had lunch there twice, which is also unusual for us. It was hard to pass up the yummy Japanese stir fries when they gave out generous samples and we could watch our selections sizzling on the big grill! The price was right, too. Outside the mall is an attractive street with a variety of specialty shops, optical center, watch repair shop, barber shop, Paul Mitchell salon, dry cleaner, UPS store, military clothing store, beer and wine store, game room, etc. The complex also has a 10-screen theatre. 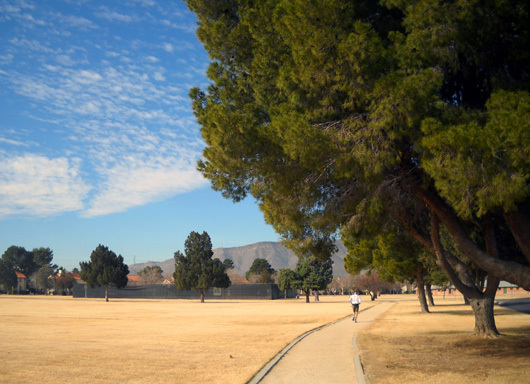 There are several fitness centers on the main post and in the off-post residential area adjacent to the RV park. Every one of them was undergoing renovations this week. We used two of them, both on Cassidy Road. We preferred the one closer to Airport Road (Stout Physical Fitness Center). Employees were busy moving all the Nautilus equipment from one room to another but we were able to use the machines we wanted. When the neighborhood fitness center on Ellerthorpe is done, it'll be the most convenient to the campground -- only half a mile away. One day Jim went to the DEERS office on post for information about using his Tricare insurance benefits. He also visited the Navy recruiting office on Gerlich Street just south of the campground to update his military records. They weren't busy; an employee suggested he get a new ID, even though his card is permanent. Christmas decorations are still up this week. I went in later to get a new one, too, thinking it could be extended another four or six years. That was a mistake. It still has the same expiration date (too early to extend it) and the photo is awful! Jim doesn't like his photo as much as the old one, either. How come we both look older than our previous ID photos??? I look ten years younger in the picture on my state drivers license, renewed less than two years ago. I'm probably one of the few people in this country that likes my drivers license photo! A couple days ago while I was getting my hair permed, Jim discovered a nice four-mile oval finely crushed rock path on the main post. We were back out running/hiking on it yesterday and today. Too bad we didn't know about it earlier in the week. It would have been a good place for me to cycle, too. Jim (in white shirt) runs ahead of Cody and me on the path. 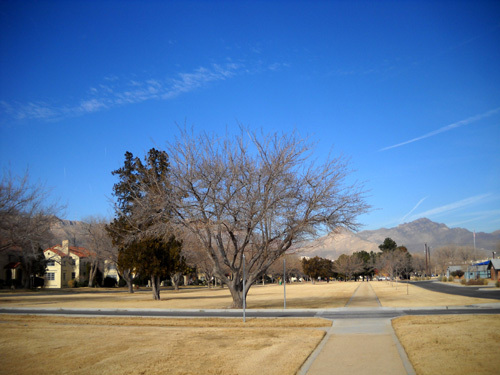 The trail winds past the replica museum, some impressive buildings, a Japanese garden, large parade fields, officers' housing, and several memorials. 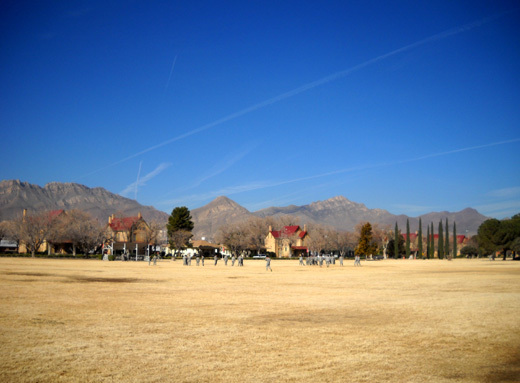 Above and below: the Franklin Mountains and officers' housing form a backdrop to the large parade fields. There are numerous access points to the trail. 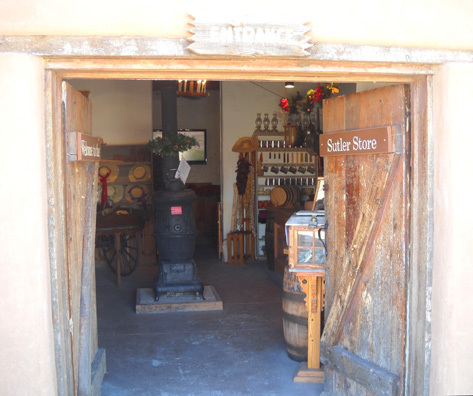 Twice we parked near the replica museum, which made it convenient to visit there, too. 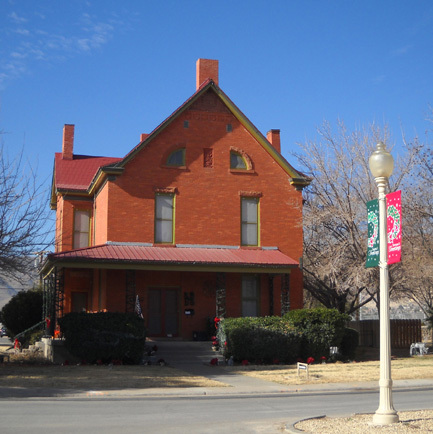 There are several museums on post that are free and open to the public, not just military families. 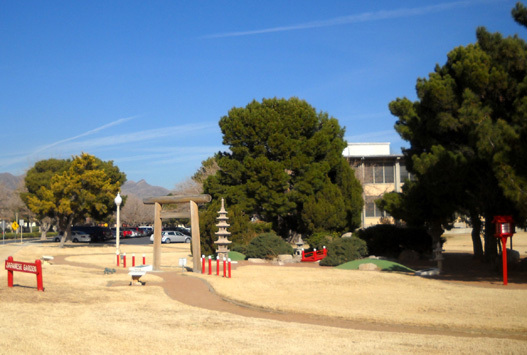 They include the Air Defense Artillery Museum, Museum of the Noncommissioned Officer, Fort Bliss Museum and Study Center, and the Old Fort Bliss Replica Museum. The only one we visited during this trip is the reconstruction of the Magoffinsville location of the post from 1854-1868. 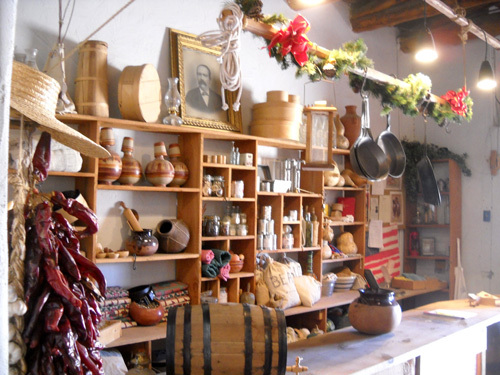 It is called the Old Fort Bliss Replica Museum. The replica was finished in 1948 to commemorate the 100th anniversary of the establishment of the original fort. 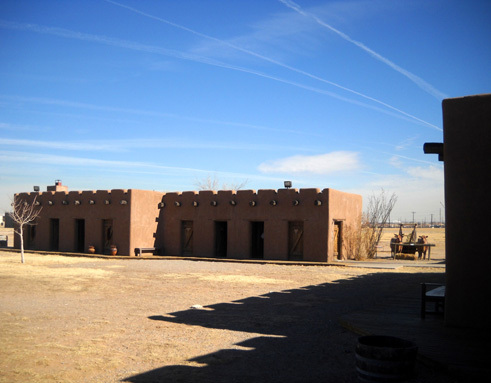 Four adobe buildings contain exhibits that depict the lives of soldiers and civilians at the fort in the mid-1850s. 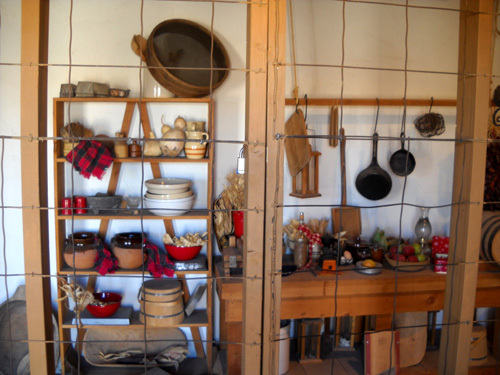 Daily activities necessary to house, feed, and maintain a military force of about 150 men at a remote frontier outpost are interpreted in the period rooms and work yard. 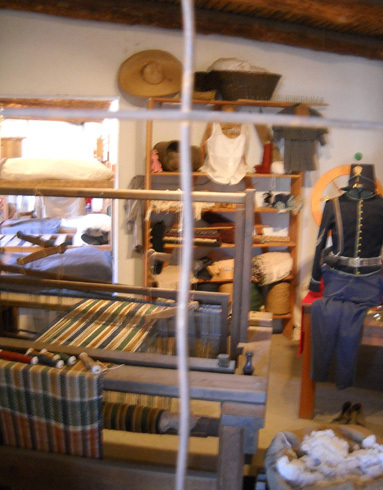 All of the uniforms, tools, and equipment are authentic reproductions -- rather than artifacts -- so they can be used by costumed interpreters during school programs and special events. 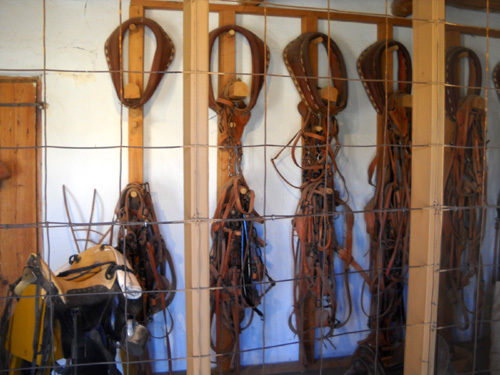 I was able to see the exhibits in three of the four buildings but had to stay behind "fencing" in two of them. The rooms are fully open only on days when school kids are going through or for special museum events when interpreters are available. 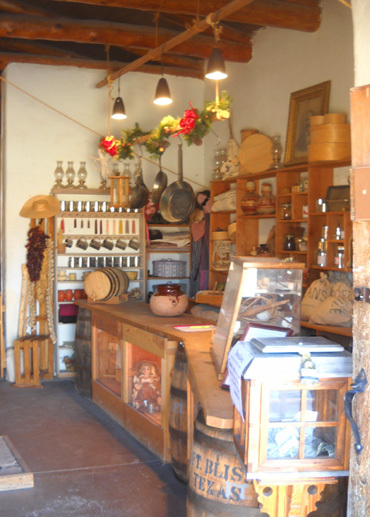 The two buildings that aren't fully accessible house the kitchen . . .
. . . the pottery, replica examples of Hispanic and Anglo clothing of the era, a loom, spinning wheel, and other tools of the clothing trade . . .
. . . the barracks, harness shop, carpenter's shop, blacksmith, and wagon shed . . . 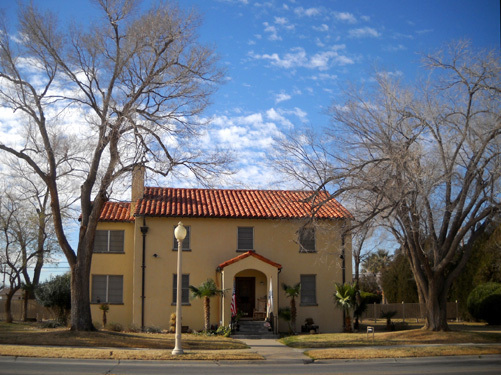 The fourth building was closed when I visited; it contains interpretive exhibits and historical artifacts from subsequent locations of Fort Bliss to the present time (remember I said its current location is the sixth?). 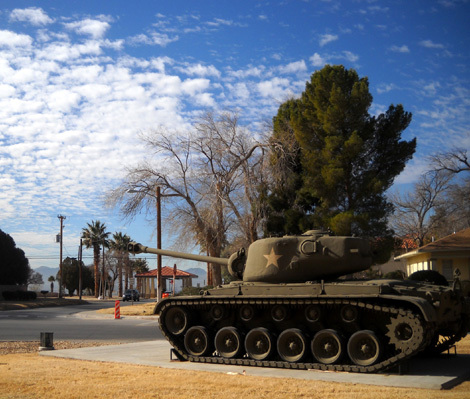 The Old Fort Bliss Museum is open Monday through Saturday. Entry is free but donations are encouraged. If you're on post, it's worth the time to check it out.